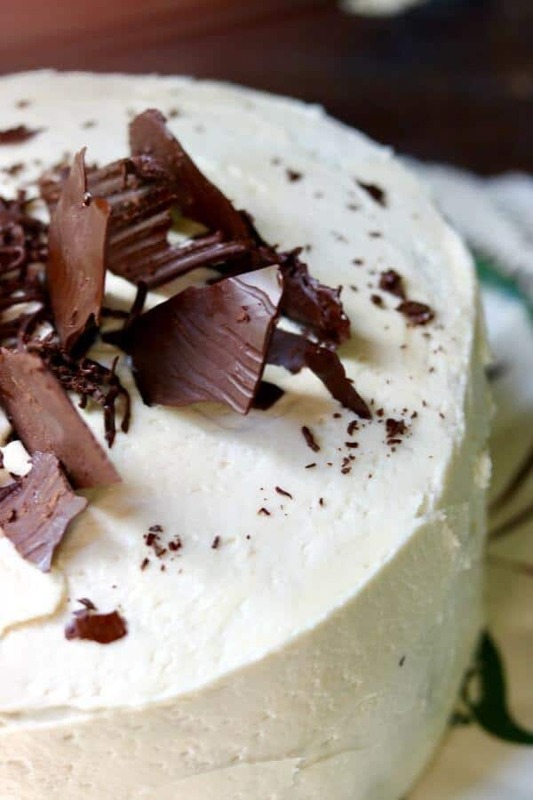 There’s nothing like a chocolate cake and this sumptuous dark chocolate layer cake recipe with Irish cream buttercream is absolutely the best. Ever. Two layers of velvety fudgy cake are separated by a light, fluffy buttercream that’s kid friendly and easy to make. If you love whipped icing you’ll be smitten with this decadent frosting for sure! Isn’t a really dark chocolate layer cake just the best thing in the world? 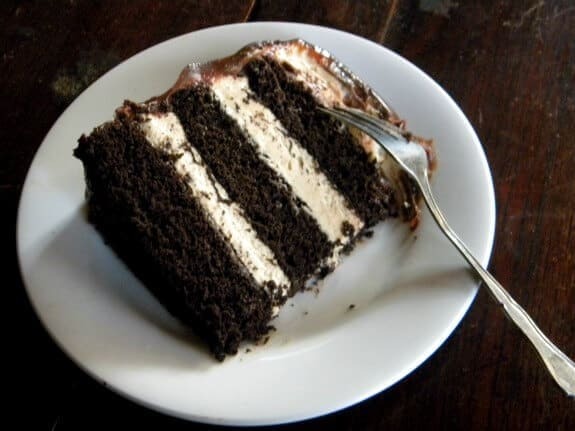 There’s something about that moment right before you take that first bite, watching the fork cut down through the layers of cake and buttercream, that is almost holy. I don’t blame the Aztec kings for saving the chocolate for themselves. So, there are chocolate cakes and then there are chocolate cakes that defy description. Honestly I think I have four or five recipes JUST for chocolate cake here on Restless Chipotle (like this chocolate black lager bundt cake)and this one might just be my favorite — at least until next time. This one is super-fatted to be tender and there’s not one thing in it that detracts from the pure chocolate flavor. The layers are sturdy without being dry and they hold together well for layering and frosting. I absolutely hate when I’m carefully moving a cake layer and it cracks or breaks. I glue it together with frosting and put it on the bottom but you know what? I know it’s a broken layer even if no one else is aware of it and it bothers me. I’m kinda OCD like that. THIS cake won’t do that – just make sure you’ve cooled it completely. I have two “in real life” friends that stuck with me through my divorce when everyone else fell away. They’ve been there for me through bad times and good times and I love them even more for it. Well Edye’s birthday is in August — and every year I throw her a surprise party on the weekend before her birthday. You’d think after so many years she’d be expecting it but every year she’s surprised. I have made this cake twice and my family absolutely loves it! I recommend it highly! 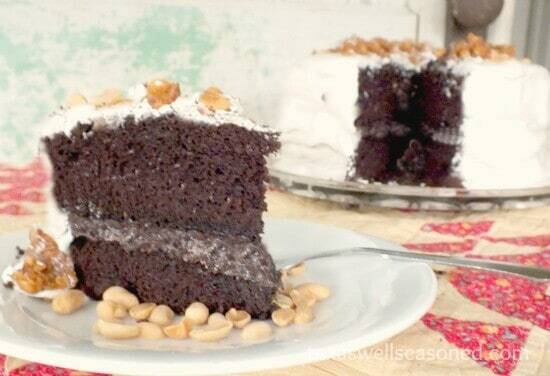 I usually try to do chocolate layer cake because…. duh… chocolate. I do try to make them a little differently every year so as not to be too predictable. This year I made a homemade cinnamon gelato along with the cake. Needless to say she loved the cake and went nuts over the Irish cream buttercream. It is not too sweet but it’s very rich so smaller slices are probably better than bigger slices. For an 8-inch, 2 layer cake I’d guess you could get 12 to 16 servings rather than the 8 to 10 I usually suggest. Use heavy baking pans. Your cake will cook more evenly and the outer crust won’t get too dark or burn. Grease the pans, then put a round of parchment paper or waxed paper on the bottom, then grease again and flour the pan, tapping any excess flour out. Use cocoa instead of flour for flouring the pans before baking a chocolate cake — no white streaks! Make sure your oven is completely preheated. Don’t crowd the cakes. There needs to be space between the pans for good air flow. Let the cakes cool completely before trying to work with them. Use a fine toothed serrated knife for trimming. Trim the cooled cake so that the top is even if it rounds up over the pan – which it probably will. Put a smear of frosting on the cake plate before putting the first layer down to keep the cake from sliding. If you want to make it really easy to assemble your cake cool the layers and then freeze them before using. I like to run a couple (usually 4) of straws down through the filled cake about halfway between the center and the edge. I do this after I’ve stacked them but before I’ve frosted. It keeps the layers from sliding around – if you’ve made cakes in Texas in August you know what I mean. I love the gold 8-inch round cake pans with handles from Wilton. These are what I use and I’ll never go back to any other kind. I used Hershey’s Special Dark Cocoa in this cake because I wanted it to have an extra blast of chocolate flavor. It’s why there is no milk in the cake – there’s really nothing to interfere with you just tasting all of that yummy chocolate. I don’t suggest making any substitutions in this recipe – you can’t substitute buttermilk for the buttermilk powder, for example. You’ll end up with a completely different cake. Same thing with the cocoa – take the time to get the dark cocoa. Hershey’s Special Extra Dark Cocoa Powder is available in most grocery stores or Amazon has it, as well as several other varieties, available. I adapted the Bailey’s Buttercream from a recipe I found on Wicked Good Kitchen. 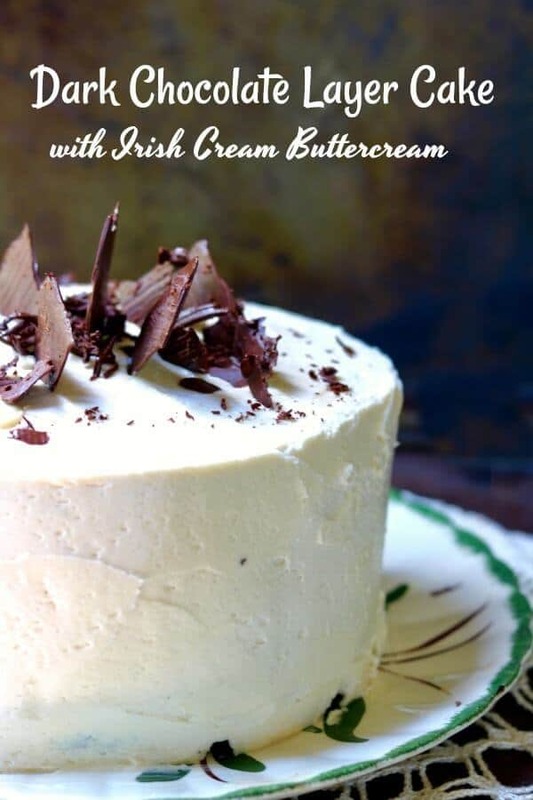 The technique of heating the Irish cream just to the boiling point is brilliant – it burns off the alcohol (or most of it anyway) and it helps to give the frosting a smooth, silky texture. This chocolate layer cake recipe would make great cupcakes, too. I’d guess it would make 24 and you’d need to bake them for 20 minutes at 375F. 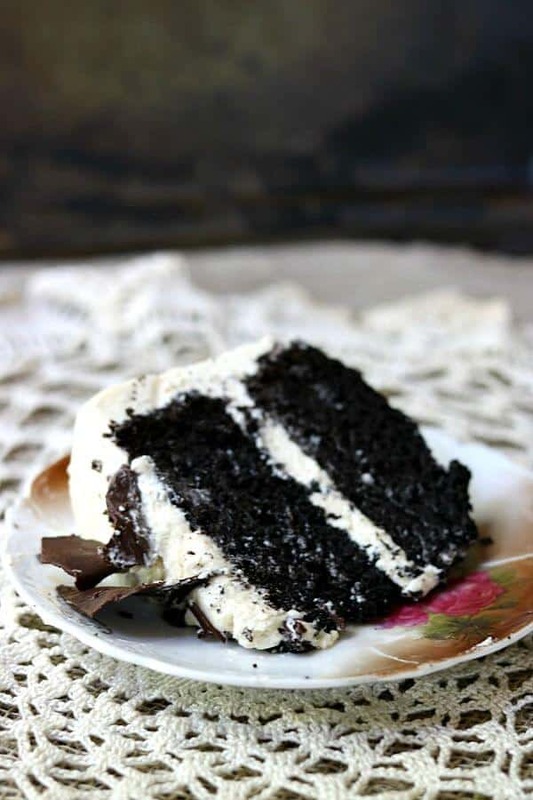 Deep, dark chocolate layer cake recipe has an airy, smooth-as-silk Irish cream buttercream frosting. Tender and delicious! 1/2 cup buttermilk powder, sifted if necessary to remove any lumps. Place an 8 inch-round piece of parchment or waxed paper on the bottom of each pan. Stir the dry ingredients together in a large mixer bowl. Whisk the coffee and vegetable oil together in another bowl. Stir it into the dry mixture with the mixer on low speed. Beat the eggs and egg yolk with the vanilla and add to the bowl. Beat on low speed until the mixture is smooth and well blended. Divide evenly between the two pans (if your pans don’t have high sides like WIlton you might need 3 pans). Bake for 30 minutes or until a toothpick inserted in the center comes out clean and the cake pulls away from the sides of the pans. Run a butter knife around the pans between the cake and the pan side to loosen the cake. Carefully invert onto a wax paper covered surface and let cool completely. 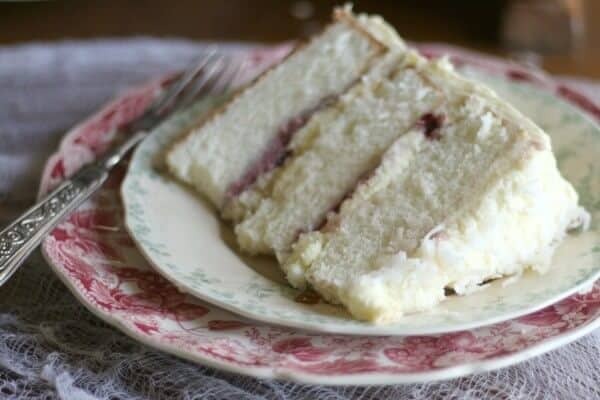 Put a smear of buttercream on the cake plate. Trim cakes as needed to make them level. Gently place the cake, trimmed side down, on the cake plate and press gently. Smooth a thick layer of the buttercream over the top of the cake. Carefully place the remaining layer (cut side down) on the top of the buttercream. Push 4 straws vertically through the cakes to hold the layers into place. Remove the cakes from the freezer and put a thin coat of buttercream over the whole thing. Return to the freezer for 30 minutes or until the buttercream is firm. This is the crumb coat and will keep the cake crumbs from showing in the lighter frosting. Trim the straws the same level as the top of the cake. Finish covering the cake with the remaining buttercream. Sift the Confectioner’s sugar to remove any lumps. Fit the stand mixer with a paddle attachment. Place the Confectioner’s into the bowl. Bring the Irish cream just to a boil. Put the mixer on low speed and carefully pour the hot liqueur over the Confectioner’s sugar in a steady stream. Turn the mixer to medium speed and beat until the sugar dissolves and the mixture is smooth and has cooled to room temperature. Add the butter and the vanilla and almond extracts. Beat until creamy and well blended, scraping down the sides and bottom of the bowl as needed. Add the heavy cream and the vanilla pudding powder and beat on medium-high speed until the mixture is light and fluffy. So excited to make the dark chocolate cake for a friend. Thank you! I just love this cake!